Living in Edinburgh’s New Town district as a wannabe Hipster myself, (in that I’m not trying to be a Hipster or trying to look like one especially, but I suspect I might have stylistic leanings that way), I am spoilt for choice for expensive barbers and stylists where I can go to go grab a hair cut and a beard trim complete with beard oils and double shots of single malt whisky. Really. My birthday-treat hair cut at Ruffians last month was amazing: “cup of tea or coffee, sir…or a whisky?” …. Nick’s slightly disinterested, dismissive facial gives way to a wide-eyed expression of “yes, please!”. So though hard to fully define, the Hipster trend has spawned the slightly eclectic and very definitely expensive brand of mens’ hair stylists and fantastic products taboot. 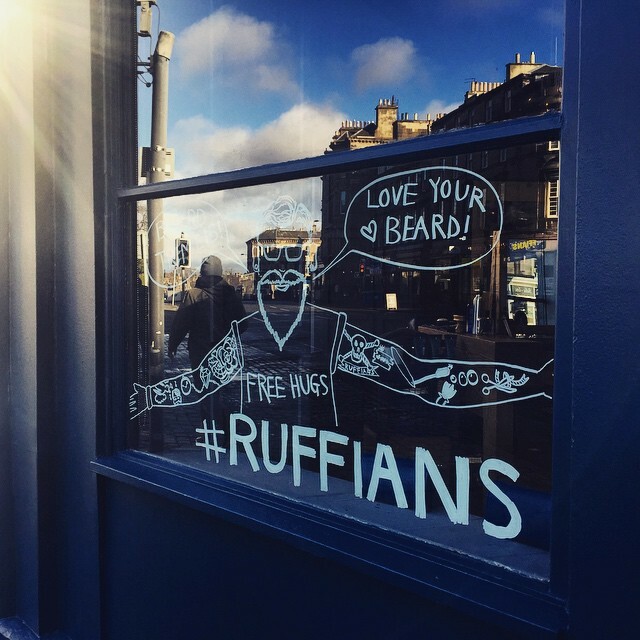 I mean, after my time in Ruffians in Edinburgh, thanks to Jura and a special oil for my beard, I was ever-so-slightly-tipsy and I smelt like a freshly cut slab of rich mahogany wood – Ron Burgundy would definitely have bought a new suit. My more serious point, though admittedly tediously linked, is that, in decades gone by, long beards, (generally quite unkempt), would have been associated more with lower social classes and even homelessness than they would expensive hair products. The stereotypical image of a homeless person or ‘tramp’ would almost invariably have included a beard. But now beards are ‘cool’ and are more likely to point to young Bohemians residing in gentrifying neighbourhoods than they are poverty and desperate social need. Oh how times seem to have changed. Or have they? Of course I can help and so can you. But, if you’re like me, every time you walk past a begging, homeless person on the streets you want to be like Peter and John who boldly usher in the kingdom at that moment of encounter with a power-filled, “silver and gold have I none, but such as I have I give you…” (Acts 3). I don’t want to give them money; I want to give them Jesus. How about we give homeless people Jesus, then? Mairi and I are taking part in Bethany Christian Trust’s Big Sleep Out in Edinburgh on March 20th. The idea is to have a little practical taste of what it must be like to have no home or bed through the harsh Scottish winter and to raise some money to support the work of Bethany that has been going on now since 1983. Their mission statement is to give homeless and vulnerable people hope and a future – I love this and it sounds an awful lot like giving people Jesus to me. Please get involved in helping the work of Bethany by giving what you can towards the £500 target that Mairi and I have committed to raise. You won’t be giving to us, you’ll be giving to the work of Bethany Christian Trust and so, the next time you pass a person on the street, you can be confident that you’ll be helping a homeless person, in a practical way. Here’s the link you’ll need.